Conquest Curlinate has been my Queen’s Plate horse since I first put my mind to having a Queen’s Plate horse. Conquest Curlinate in the post parade before the 2015 Illinois Derby. I had my eye on him since his debut last year, when he finished a late-running fifth beaten just two lengths. The race looked too short for him. That opinion bore out when he returned at age three and made an impressive maiden score at 1 1/16 miles at Oaklawn. 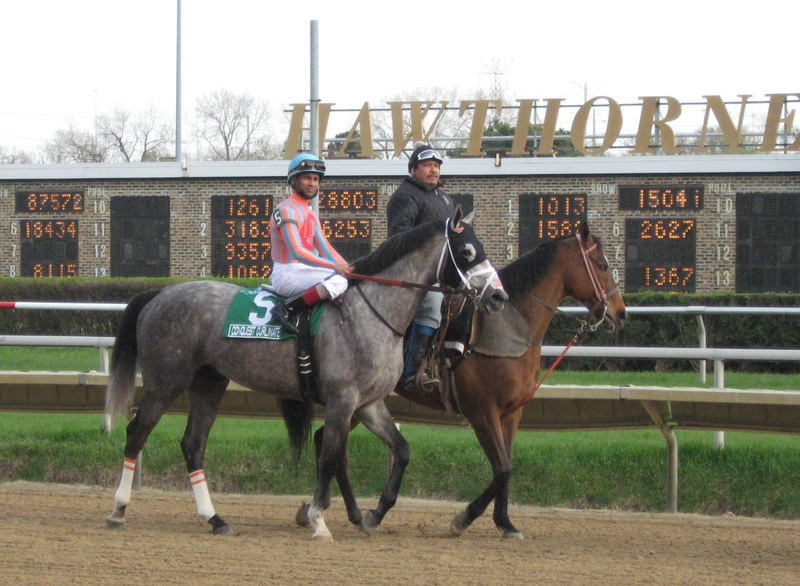 After finishing third in an allowance, he came up to Chicago, where I was fortunate enough to see him in person in the Illinois Derby. He flew up for second, beaten just a nose by Whiskey Ticket. Seeing him run made me happy, and just seeing him made me happy. I was already a fan of Conquest Curlinate going into that race. How could I not? I love Curlin babies, I love grey horses, and I love Conquest Stables. But, seeing him in the paddock was something else. He was a gorgeous, grey tank, and though he had greyed out considerably from how he looked at two, he still knew how to put the “roan” in “grey or roan”. His connections supplemented him into the Belmont, but decided not to run there…that he wasn’t quite training well enough, and that he would point to the Queen’s Plate instead. That made sense — Conquest Stables does tend to be cautious with their placings. If he wasn’t quite ready for the Belmont, they were not going to run him there. The Queen’s Plate looked like a great spot, though. He had handled the poly fine on debut, and handled it well again when he finished second behind Danish Dynaformer in the Plate trial two and a half weeks ago. This morning, Keith McCalmont from Woodbine announced that Conquest Curlinate was out of the Queen’s Plate due to a minor injury in training. I don’t have a ton of detail on his injury, just a quote from Mark Casse that he had to check abruptly during training. Given how good Conquest Stables is about keeping the fans posted on their horses, we should know more soon. I just hope it remains something minor, and that he will be back to the races shortly. Get well soon, Conquest Curlinate!